Newton discovered that there is an interaction between two material objects, the character of which is that two bodies attract each other with a force which is directly proportional to their mass, and inversely proportional to the square of the distance between them. It turns out that the nature of interaction taking place between living objects can be described in a similar way. It is obviously not as simple as Newton’s law of universal gravitation, yet it is quite formalized. I have read many books about a mathematical approach to the issues of life, but none of them dealt with the concept of pursuance, and none of them attempted to generalize the interaction between living objects. The issue itself is relatively simple and, as we will discover in a moment, it successfully explains many situations. Its deeper analysis allows for discovering complex phenomena, with direct results such as: tactics and strategy, improvement mechanisms or issues regarding the feasibility or effectiveness of actions. Pursuance is a generalized type of interaction between two objects, resulting from their pursuit of a goal; a specific goal, which is a result of a natural conflict of interest between living objects. Let us discuss it using an example of a group of phenomena and issues occurring during a chase and an escape. It would be an error to identify pursuance only with the idea of a chase, because the goals involved can be very different such as wealth, satisfaction, a watch or food, and there are many ways to pursue these things. For example, wealth can be obtained with a slick political manoeuvre, winning the lottery or working effectively, and one can own a watch by buying or stealing it, or possibly by making it oneself. But to the point. Let’s examine two objects: N - pursuantly chasing (pursuantly trying to achieve its goal) and C - pursuantly fleeing (pursuantly trying to prevent N from achieving its goal, because the achievement of its goal by N will be equal to a loss for C). The goal of N is to catch up to C, the goal of C is to escape from N. The conflict of interest is that what N is pursuing is exactly what C wants to avoid. Let’s look at the drawing which shows this situation at the initial state t0. The action performed by N consists of the following sequence: locating the position of the fleeing object, tracking the direction of the chase, performing an action which transforms some of its resources into speed in order to move closer to the goal. It is obvious that the sense of speed vector is the same as the direction of the chase, but its value is not as obvious. For if it is too small, N will not catch C. If it is too high, it will be harder to manoeuvre, and in an extreme case, could even cause N to self-destruct. There is also a possibility that C will dodge to the side and the speeding N will pass by, thereby not achieving its goal. High speed is also related with an increased use of resources and can cause the pursuant to be forced to stop before it has reached its goal as it has exhausted them. Already at this stage of our discussion, we can see an outline of few interesting issues which a pursuing object might have to consider. These include: issues related to locating the goal, the methodology of determining a suitable speed of pursuit, balancing resources and estimating the chance of achieving its goal. t1 moment of the pursuance - analysis. Let's examine the situation in the next moment - t1. N locates the position of C again and concludes that C is not on the course of the chase set out in t0. Based on this observation, N concludes, quite reasonably, that C is not standing in one place but is changing its location. A question arises here; is this a natural change, which confirms with C's regular behaviour, or is it a result of the fact that C noticed that it is being chased by N and has taken appropriate steps related with an effective escape? N must take each of these possibilities into account in its analysis to determine the new direction and the new speed of the chase. 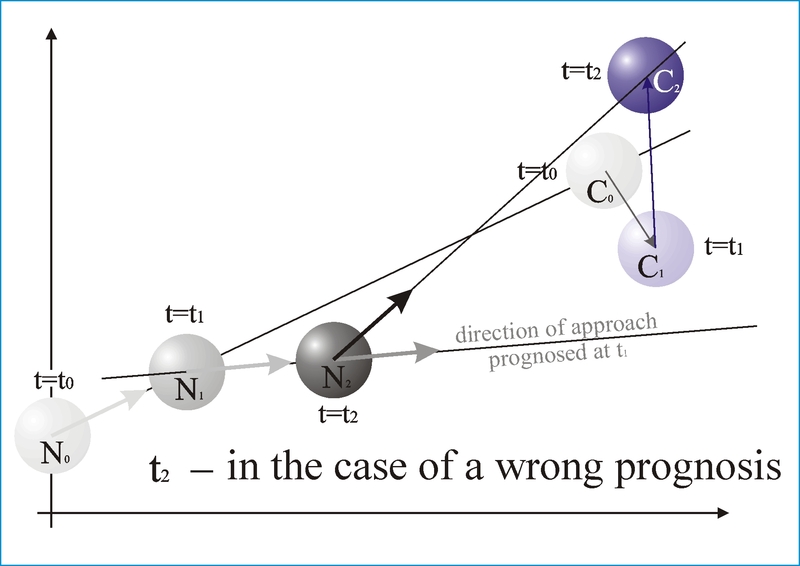 N must make some assumptions about the movement of C. It could, for example, assume that C will continue to move in the same direction as before, meaning that in time period t1t2, it will move in exactly the same way as in t0t1. Let’s say that N has adopted this assumption and set out a new direction for its chase on this basis. This situation is presented in the drawing “t1 moment of the pursuance - prognosis". By the way, let's notice that at t0, N did not have to think about this aspect and was not basing its actions on any assumptions, it simply directed itself towards C and started to move. At that point, it was obvious for us: since N knew nothing about the behaviour of C, it assumed the simplest method for the chase, which initially seemed to be the most effective. At t1, this method is neither the most obvious nor the most effective - all because C started to move. Taking this fact into account, N must engage all its intelligence in order to find the most effective chasing method. This methodology of preparing its next move, which will take us to our goal in the most effective way, is called tactics. t2 moment of the pursuance - with a good prognosis at t1. Let’s see how the situation developed in the third stage - t2. Everything depends on whether N has predicted the behaviour of C correctly. If so, it will make a slight correction in direction at t2, which takes into account the further movement of C at a fixed rate, in which case it can speed up, reducing the duration of the chase. So, if object N manages to determine the character of C's movement correctly, the pursuance will use less resources and will be shorter. Let’s not forget, that each action carries a certain expense. Everything costs: generating speed, measurements and analysis, and the object must use its resources to cover these costs. t2 moment of the pursuance - with a wrong analysis at t1. Let us now consider another possible variant of the situation in the t2 moment. 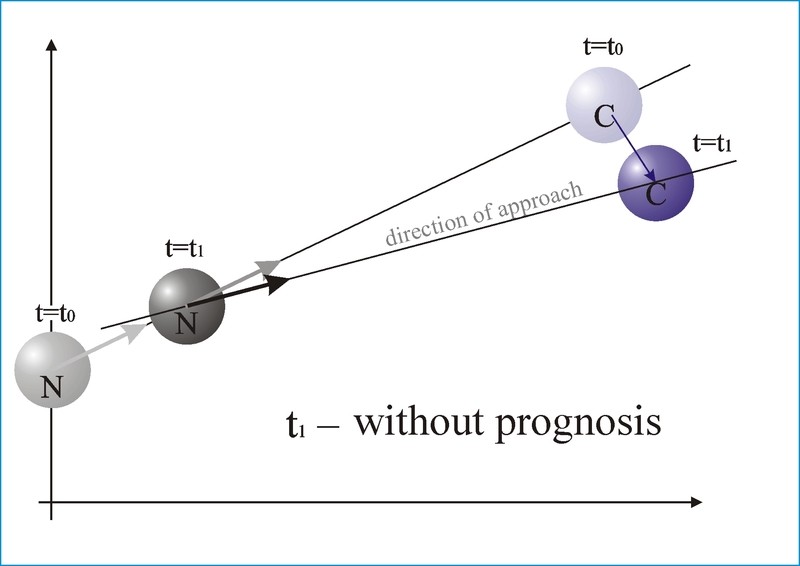 Let’s try to find out how the chase would develop if the prognosis of the fleeing object’s movement was incorrect and C was in a different location than that predicted by N. It would then require a major correction in its movement and, as a result, increase its costs. Speeding up the chase would not be possible as, in short, the chase would become less effective. The correction of movement itself is a problem, because it is not certain which method should be applied. N could try to discover the pattern of C’s movement and wonder if it moves on a sinusoid, for example, but as for now, there is too little data for such analysis. An attempt to discover the pattern in the escaping object’s movement is nothing else but determining its characteristics, or, to put it in a more general way, to discover the escape tactic. 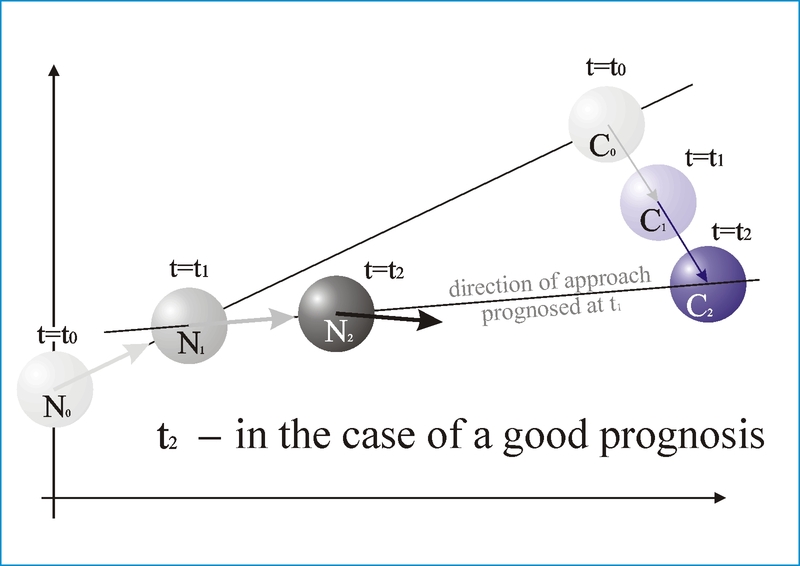 Let us note that object C can also look for effective solutions, similar to N. It can, for example, want to be caught because the achievement of the goal by N is equivalent to gaining of an advantage by C, or the opposite. Aware of the threat of a loss, it might want to escape at any costs, using an analysis of the chasing object’s movement. Let us consider how this chase would look without the attempts to discover these characteristics? If N kept using the same method, let's call it straight pursuance, it would consist of performing the same actions at every moment: locating, setting out a direction of the fastest approach and moving in that direction. t1 moment of the pursuance without prognosis. t2 moment of the pursuance without prognosis. By analyzing the drawing, we are able to draw the following conclusions: straight pursuance brings better results than a pursuance with bad prognosis. On the other hand, it is less effective than pursuance with a good prognosis. At this point you might wonder whether the greatest politicians, successful businessmen, traders and stock market players use the pursuance process and follow their seventh sense (consciously or otherwise) and select the option with the best prognosis. and in relation to the opponent disharmonisation. In martial arts there is also a way of overcoming the opponent by using their resources, such as momentum or swing. Japanese judo or "gentle way" is the name of such a tactic. In English, a more appropriate name may be inversion. The opponent can be trapped in such a way that they will not be able to perform any meaningful move. So they can be snookered. In sports, where concentration plays a very important role, one recognised and effective method is to provide a competitive advantage by unbalancing physically and/or mentally an opponent. The name of this tactic is unbalancing. Two of the most basic tactics are the counter-attack which means to encourage your opponent to attack, allowing you to exploit the now-weak defence and dummy attack when yopu show one attacking move, to provoke a typical reaction and attack in an alternative way. Counterattacks and combinations can be combined into sequences called chains. Since pursuance is a process-based feedback mechanism, and decisions are based on the information being collected about the opponent, therefore, there are many deceptive tactics called misinformation. To find out the tactics used by an opponent the fact-finding is applied. It can be carried out for instance: by observation, third party opinions, performing dummy actions and watching the reactions. A common psychological phenomenon in pursuance is euphoria from success - the loss of the ability to effectively achieve the objective under the influence of an exceptionally well executed, so far, pursuance process. A discussion and analysis of three subsequent moments in the pursuance should be sufficient to grasp its essence, an analysis of all subsequent moves would be analogical to those discussed so far. Let’s think about what effective pursuance depends on. It surely depends on the goal itself - on how clearly and precisely it has been defined. In many cases we strive towards... we don't know what exactly. Communist ideologists talked about universal happiness, which the society would achieve under their enlightened leadership, explaining clearly and distinctly what this happiness would consist of: everyone would receive according to their needs and work according to their own capabilities. I wonder what economists would have to say about it. Would they say that such a state is even possible? And philosophers, would they agree that this is what complete happiness looks like? I myself have a completely different view on this subject, moreover, a large part of humanity as well, and that for many years. Let’s for instance look to Homer: Odysseus preferred to return to his wife and son than to become immortal and live a life filled with delights with the beautiful nymph Calypso. He tried laziness for a time, but he did take to it. On measuring the distance to the goal - if we know what the goal is, then in order to locate it, we must be able to determine the distance between us and the goal. This one value we need to know. It is therefore necessary to define a measurement of this distance, or the method of its calculation and units, in which the results of these measurements will be given. At first glance, an ideal measure seems to be a geometric distance measured in metres. This works in the case of a fox chasing a rabbit, a runner striving for the finish line or a missile intercepting a plane. For more complicated pursuance, such as seeking to ensure an ideal health care or ideal level of economic growth, measurement in metres is totally inadequate and a new means should be defined, one which is appropriate for the purpose. Without this definition, we cannot talk about completing the pursuance, because we do not know how far from the goal we are. 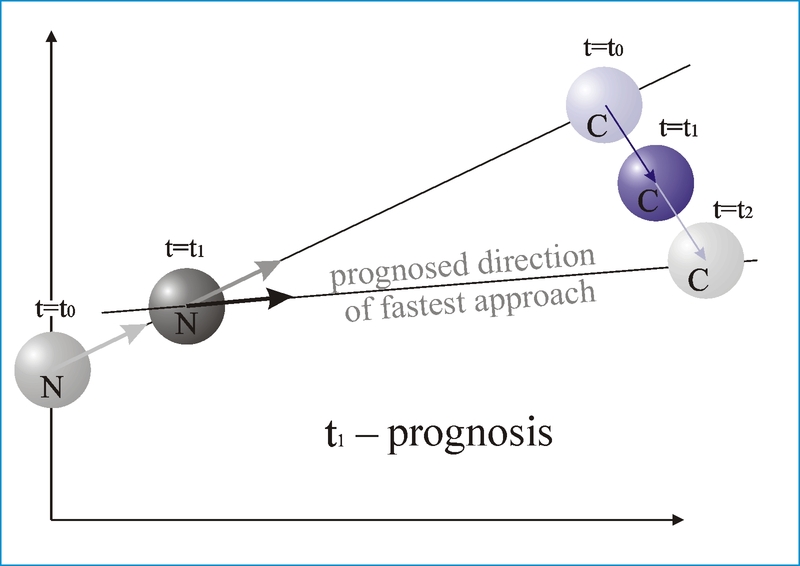 It is worth noting that the sensors and analyzers used for the implementation of pursuance must be able to operate in the scope of this measurement and its derivatives (a derivative measure of geometric distance is speed and acceleration, meaning the "characteristics" of this measure changes over time). On the method of analyzing the opposite object’s behaviour. The concept of "behaviour" should be understood as the history of changes of the distance measurement and its derivatives. If none of the objects conduct such analyzes, their mutual reaction cannot be considered as pursuance. It is them who decide whether the given interaction can be classified as a pursuant interaction - it requires for only one of them to analyze the behaviour of the other. With identical physical parameters, the advantage is with the object which is better at data analysis. In most cases, this statement is correct, but the concept of over-thinking or over-doing is also an issue. If totally irrelevant factors are analyzed, wrong conclusions will be drawn. A continuous analysis of all possible signals and ongoing preparation of an optimal solution are very expensive and practically impossible to achieve in most situations. Only information which is deemed important or which turned out to be the most important is selected, and for chasing or fleeing, well tried methods are used, drawn from a bank of methods. In case of animals, these well-tried methods include well-trained moves and instinctual behaviour, proper to their nature, described by some researchers as automatic behaviour patterns. On the state of resources. In the case of the fleeing plane and the missile chasing it, we can differentiate resources such as fuel supply, quality of onboard computer systems, effectiveness of its software and correctness of the algorithms controlling the object, as well as the sensitivity of sensors, etc. Resources of a student passing an exam will not be only his knowledge of the given subject and skills in using it, but also resistance to stress, appropriate appearance, self-assurance, a smile, etc. Some sensors, even if of very high quality, are not enough; one must be able to use them: an animal with an excellent sense of smell must also be able to ensure a reconnaissance from leeward direction from which no odour will reach them. For this reason, it should scan the area with its sight from time to time. It must also prepare an appropriate method of observation, which is also a part of the animal's resources. On the efficiency of transforming resources - an example of this could be transforming the supply of glycogen stored in the muscles into speed needed in the chase. The efficiency of transforming one resource into another is very closely related with cost. If two objects possess similar resources, the method of taking advantage of them is essential. Among two motors with the same power, the one which uses less fuel will be better. Although it accelerates like its rival, it will work longer and therefore get further. On the number of factors and the method of their analysis. 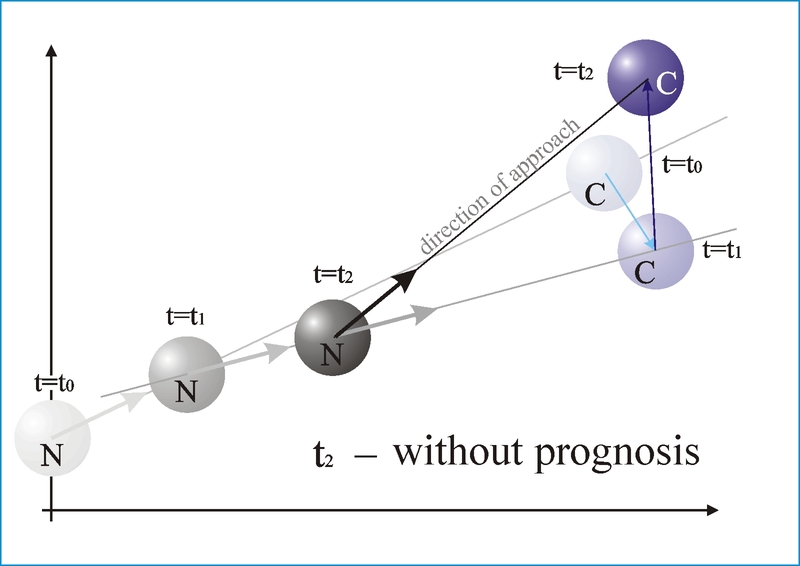 An object pursuantly chasing can only analyze the distance between itself and the chased object - of course under the condition that it is capable of measuring. We know that the more closely we look at some phenomena, the more details we see. Skilful separation of data significant to the pursuance will surely add to improving the effectiveness of this process. Attempting the manoeuvre of overtaking a car, I always make sure to check who the driver of the car I am passing is. If it is a woman, I feel that my chance to get in front of her safely is better. If it is a young man dressed in a shirt and a tie, God forbid, driving a company car, my alertness is increased, because this type of driver can always do something unpredictable. The fact of who the driver is may also be incorporated into the measure of distance from the target, which in this case is the successful completion of the overtaking manoeuvre. One must be able to convert the gender of the driver into the appropriate manoeuvre which brings us closer to the goal or reduces the risk. Of course I have such a conversion table in my head, based on my previous experiences behind the wheel. However, we must remember that we as beings are rather limited and are not able to analyze all the stimuli that we receive. This forces us to use the method known as action on indicators, which consists of imposing filters transforming the stimuli reaching us into the form of the said indicators. No need to waste time on a continuously controlling the brake shoes in the car, even though if they become worn out, they may be a risk of causing a serious accident. So that every car owner doesn’t have to dive under the car every week and check the extent to which they are used up and whether it is already that very moment when they have to be replaced, engineers have installed a red-light indicator signal, which lights up only when the brake shoes are worn out to a greater than acceptable degree. On the speed of the locating process. Eyes and ears - living objects’ sensors - are used to react to stimuli sent at high speed. In order for an object to survive, these organs must react to stimuli as quickly as possible. The faster an object realizes that it is in danger, the greater chance of survival. Man has developed devices which operate on similar principles, such as radar and night vision. In other circumstances, time is not so important - if, for example, the purpose of the pursuance is to issue a conclusive verdict about someone's suitability for the team, even observation during a few months of internship does not seem too much. On sampling frequency. The more often we are forced to repeat the process of determining the location of a goal, the more resources we use. A hunting cheetah keeps its eye on the victim - it is locating its position in a continuous manner. The cost is practically none for the predator. This is an example of an ideal mechanism: continuous observation with minimum use of resources, and the results achieved are immediately available with almost one hundred percent accuracy. It is a little different in the case of tracking a submarine using sonar or an aircraft by radar. Due to the complexity of the issue, the tracking takes place not in a continuous manner, but in intervals. This non-continuous monitoring is called discreet sampling, and the information obtained is called discreet information. A good example of pursuance with a small sampling frequency is checking our children’s progress in learning. We are not capable to track it in a continuous manner, since we are not with them in class at all times, but we sporadically meet with their teachers during parents’ evenings. On the analysis of similar pursuances completed so far. The so-called life experience. A chess player, in order to get to a master level, must play tens of thousands of games, recognize effective patterns and remember them so that in the future he can use them in similar situations. Farmers living in moderate climate zones, with distinct differences between seasons, have knowledge of what pursuance is, even though they have probably never heard about it. The pursuance which they complete consists of making sure that they have food - they sow in the spring, look after the crops during summer, so everything grows as it should, and they reap the harvest during the autumn. One of the methods used by them is to transform food so that it will be available during winter and the pre-harvest period when food is scarce, called przednowek in Polish. The awareness of the fact that one may die during the winter has formed prudence in them. On memory and the method of managing it. In order for a pursuing object to be able to analyze anything, the material needed to be analyzed must be remembered from somewhere and the so-named memory is used for that purpose. The management of memory comes down to a few basic issues: "What to remember?" (Is it worth remembering? ), "How to remember?" (Exactly step by step or only the most important fragments, or maybe only the characteristics or principles? ), "How to find the recorded information?" (Which of the 17 million things which I remember can help me in solving the given problem?). Methods of managing memory include: discovering mutual connections between events, discovering the principles and characteristics (for example of behaviours), ability to classify and catalogue, the method of storing and the speed of reaching the desired information. It isn’t hard to notice that the basis of all the above methods is mathematics. The fact that our brains are designed to be able to use these methods is proven in a few sentences spoken by Susumu Tonegawa, a Japanese biologist (b. 1939): ...nerve cells in the - the brain component responsible for memory - create a map of new places and events in our minds, in order to use them in the future. Also in the hippocampus, there is an area of the dentate gyrus which plays a key role in the ability to distinguish between similar experiences. […] Episodic memory is of great importance to intelligent creatures, enabling them to orientate themselves in different situations and subsequently recall old experiences. As you can see, memory stores episodes, that is traces of events and information on the subject of mutual relations between these events. On different properties of both objects and their states. The determined favourite, who, just before the competition, gets an upset stomach, greatly reducing its chances of winning. Another example can be found in mechanics, in the phenomenon known as the natural frequency of the object. If, during the chase, one of the elements of the object falls into such a vibration frequency, it will increase violently until the object self-destructs. Bridges, for example, are subject to this phenomenon - soldiers passing through should not march in an even step in order not to create vibrations which might make it wobble in the vertical plane and destroy it. Social reforms, carried out successfully in Switzerland, might turn out to be totally ineffective in, for example, Vietnam or Paraguay, only for the reason that some of the characteristics of the Swiss (seen as objects) have a totally different state than the characteristics of the Vietnamese or Paraguayans. This is due to the high level of law obeyance in Switzerland, which cannot be said of other nations. This follows naturally from the fact that the Swiss have the best method of creating laws - a general referendum. On the delay time. 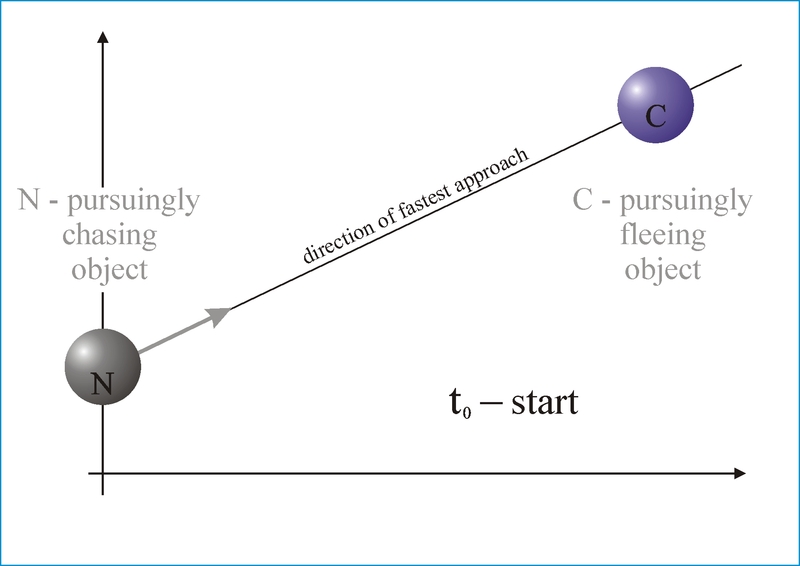 Some time passes between locating the chased object, even if it was completed at the speed of light, to preparing the next step during the chase. This is called delay time. It may be significant enough that the chasing object, which may have better resources and properties than the chased object, never reaches the goal because, in its calculations and actions, it is simply too slow. Too quick a reaction time, which is not as obvious, could also be a cause of a failure in fulfilling the pursuance. The dependence of pursuance on the delay time can be well observed while learning to ride a bike. We maintain a vertical position with an appropriate inclination of the body and correct turning movements of the handlebars. The skill of riding a bike is mostly based on being able to find the right reaction time. Turning the handlebars too quickly can cause too great an inclination in the opposite direction, and we are not able to prevent ourselves from falling. Too long of a delay, equivalent to a lack of reaction or too slow a reaction, can in consequence lead to falling over. Philip II of Macedon owed his success, among other things, to his ability to act fast because he made his decisions by himself, after a consultation with advisers. On the other hand, in democratic Athens, decisions were made by entire collegiate bodies, which significantly delayed their implementation. On the method of reaction. A nice little story happened to me one time. When I was driving my friend to the airport, suddenly I noticed a cat running straight under the wheels of my car. Of course, I pressed the brake pedal hard in order not to run it over! You could say that I instinctively performed a pursuance action aimed to save the cat's life. However, I was driving too fast for my action to bring the desired effect – and, unfortunately, the cat died. It is an unpleasant, unusual situation which does not happen to everyone. My friend praised me for my reaction. To comfort me, he told the story of how one of his friends, in a similar situation, in order not to run over a squirrel, broke too violently. His car fell into a skid and crashed into a tree. The nice forest creature probably escaped alive, but the driver died of his injuries. On external conditions. Even a tiny change of conditions, in which the pursuance takes place, can undermine or even destroy it. Resistance to external disturbance is such an important feature that it will be thoroughly discussed in the chapter on systems and processes. Example 1: Academies of effectiveness. and continue to behave in this way until the goal is reached. (In order to ensure this consistency, the Academies of efficiency provide checklists that you need to fill in every day). Most of us cannot do this, because either we are not able to measure or set ourselves realistic goals (the desire is not a goal) or use the wrong methods. Everyone wants to be rich, but not everyone wants to be an Olympic champion because we know how much hard work and sacrifice it costs. If you want to be rich, you need to realize that the path to this goal is very similar to sports training - tedious, monotonous and continually consistent. Example 2: Pursuance in the military. The military staff were pretty inefficient, they lost the ability to command almost immediately when the army began to move. They did not have enough means of communication and if they had them, they did not know how to use them. And besides there came another "unexpected" factor, "by his persistent counterattacks the enemy disturbed our perfectly created plans". In short, the soviet military staff were more like a groups of retarded school children rather than the "brains of the army". This is a typical case where A wrongly assumes that B will not react. And in reality B reacts so efficiently that it destroys the pursuance abilities of A. Example 3: Perfecting your pool skills. Play against better players and learn off them and then adapting how you play. First, get involved and then we'll see. The art of speech shows that speeches previously prepared does not create the desired effect on the audience. The speaker should alter his speech depending on the impression he has already made. A special case of pursuance worked out by John Boyd in 1970-1980. Full description of OODA loop in Wikipedia.